Carlsbad is a North County Coastal Community located in beautiful San Diego, it has the perfect mix of homes and businesses such as Highly Desired Communities, Miles of Hiking Trails, World Class Resorts, Upscale Forum Shops, the Carlsbad Village and Carlsbad Premium Outlet Stores. It’s a great place to work and play! There are over 20 trails to explore that include: Aviara, Bressi, Calvera Hills Village H North, Calle Barcelona, Carlsbad Oaks North Business Park, Coastal Rail Trail, College Calavera Hills, Veterans Park, Hidden Canyon, Hosp Grove, La Costa Glen, La Costa Valley, Lake Calvera, Rancho Carrillo, Rancho La Costa Preserve, Roberston Ranch, Poinsettia Lane, San Pacifico, Sea Wall, Villagio – Arroya Vista, Waters End and more! Click here for each trail to learn how you can explore them yourself! Who doesn’t mind a little bit of relaxation time away from your home at a nearby resort? You can easily escape your Carlsbad home to one of its local world class resorts in just minutes. The Park Hyatt Resort is located on a natural lagoon in Carlsbad where you will experience wonderful restaurants with sumptuous cuisines, a signature spa, luxurious room suites and an 18-hole Arnold Palmer-designed golf course. The La Costa Resort has been another local favorite for its gold standards for wellness retreats and was recently named #1 Wellness Spa in the nation by Spa Magazine and Travel+Leisure’s #4 Spa in North America. The lush atmosphere echoes in the newly renovated resort where you can cater to your plate with a variety of options at the Spa Café, enjoy sitting poolside at one of the numerous Pools and Waterfall Showers, or catch a round of golf at one of the most storied Gold Medal Golf Resorts in California. Located within the limits of Carlsbad are many shopping centers. The Forum Carlsbad has an elite collection of merchants, gathered together in a beautifully unique Southern California setting. 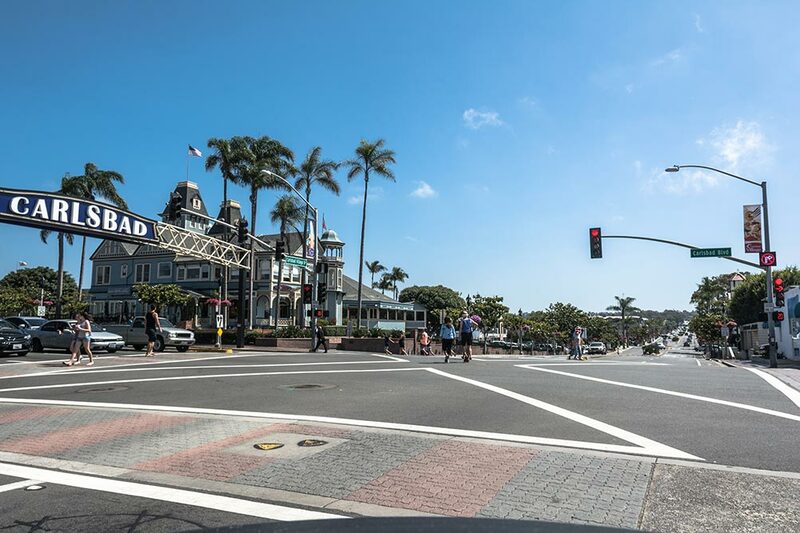 Stroll The Forum’s Main Street while enjoying the best selection of shopping, dining and life that North County has to offer. Find a list of shops at the Forum Carlsbad here. The Carlsbad Village is considered to be the famous downtown of North County San Diego. It is the heart and soul of Carlsbad, California. Influenced by historic roots, proximity to beautiful beaches, and an unbeatable climate, the Village is a favorite destination of locals and tourists alike. With shops, restaurants, hotels, and many services, the Village has everything you need whether you’re visiting for the weekend or you’ve lived here for 20 years. Another attraction to the Carlsbad Village is the State Street Farmer’s Market. You can enjoy fresh organic produce, locally prepared foods, handmade crafts, and live entertainment in the heart of Carlsbad Village! Join the community every Wednesday from 3:00PM – 7:00PM on State Street between Carlsbad Village Drive and Grand Avenue. Carlsbad Premium Outlets features a collection of the finest brands for you, your family and your home. You will find impressive savings at Banana Republic, Barneys New York, Calvin Klein, Cole Haan, Crate and Barrel, DKNY, Juicy Couture, Lacoste, Michael Kors, Polo Ralph Lauren, Theory, Tommy Hilfiger and more. Click here to see what the current and hottest deals are going on at the outlets!